Stuff Points: Earn 16 points when you buy this stuff. Are you tired of the loud, irritating noise your washing machine, power tool or other appliance is making? Does yours sometimes "walk" away without any help, only to be found in a completely new position? Then you need VibeAway Pads. Most noise and movement of washing machines, dryers and other appliances is due to intense vibrations that occur during different cycles or types of use. For washing machines, some models are worse than others, but most vibrate and make noise at some point during the wash cycle. 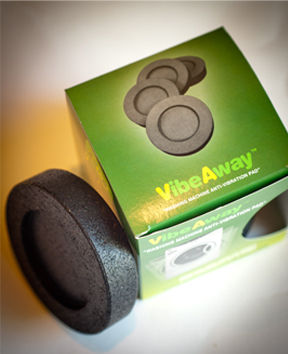 VibeAway pads are specially designed to absorb those vibrations to prevent noise, and eliminate unwanted movement. 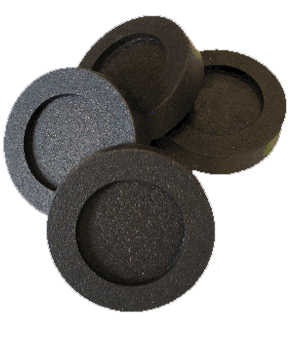 They were made for use on washing machines and dryers, but any large appliance, power tool, or light machinery with feet can use Vibe Away pads to absorb shock, reduce vibration and eliminate noise. This is an eco-friendly product that is constructed from 100% recycled car tires, which makes them incredibly strong and durable, as well as perfectly suited for use in vibration reduction. VibeAway are basically a shock absorption pad that is used to reduce sound, vibrations, and pulsating of washing machines, dryers, table saws, freezers and other large appliances. The durable material will last for years and should never need to be replaced with normal use. Since they prevent unwanted movement, they will help prolong the life of your washing machine, dryer or other appliance by reducing stress on the parts, and helping it to operate under more ideal conditions. Thanks to the sound dampening properties of these pads, they will also reduce the transfer of noise from floor to floor or between rooms. For this reason, they may prevent any need to reinforce upper level floors or take other drastic measures to deal with the vibration and noise it causes. Based on known ability and proven performance, these pads have a full refund guarantee from the manufacturer, as well as a satisfaction guarantee from us. This is a worry free purchase to solve all of your noisy appliance and power tool problems. Rugged natural rubber construction makes them virtually indestructible, extremely resistant to wear, and able to last for years of reliable protection. It is quite typical for washing machines and dryers to wobble, shake and move during regular cycles. Even brand new machines with all of the bells and whistles will tend to vibrate during the spin cycle at the very least. Large power tools like table saws will vibrate by nature because they have parts that are constantly moving, and they often experience changes in workload, differences in material, as well as changes in force needed for results. Steady levels of vibration will cause wear on your machine, and the floor beneath it. It will also create unwanted noise that can be heard throughout your entire house in some cases. These pads will help to eliminate this type of action, so that you are left with less noise and a better functioning appliance. The VibeAway pads will protect your floors, reduce noise and movement, and help to increase the overall life of your washing machine, dryer or power tool. In addition to being made of recycled content, the VibeAway pads absorb vibration and allow your washer or other appliance to run more efficiently, so every time you use them you are extending their life, and getting more use out of the resources it took to create them. 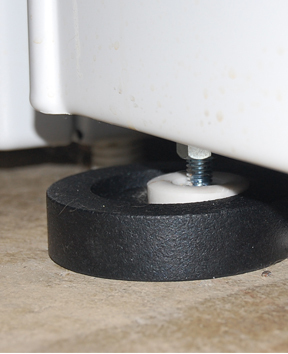 Make sure that your washing machine, table saw or freezer is sitting on a level surface before setting up the pads. To install them, simply slide one VibeAway under each corner of your equipment. Have someone else lift up each corner as you slide in the pads one at a time. The textured side should be facing up, and the foot of the appliance should rest inside the recessed, inner circle. Be sure that the pads do not move or turn under the feet to ensure that they are secure. It may be required to adjust the feet somewhat to hold the pads steadfast to the floor. That's it. it's that simple. Once installed, your VibeAway pads will last forever, and require no maintenance. Order Yours Today! Max Appliance Foot Size 2.125"
Uses Prevent vibration and walking. Use on washing machines, dryers, table saws refrigerators and other large appliances. 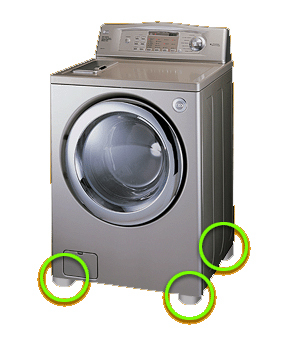 Vibe Away - Anti Vibration Pads - Stop all of that vibration and prevent your washing machine from walking away. This easy to use product will reduce noise, protect your floors and increase the life of your appliance. So far they are working. My machine is not vibrating or moving. I haven't gotten to put them to work yet but am looking forward to using them. I'm almost sure this will help aid in the vibration of my washing machine. Use in your washing machine or dryer to eliminate wrinkles, soften fabrics, remove lint, and cause either machine to run more efficiently.